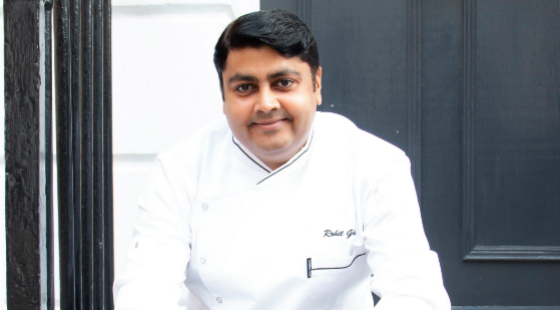 Rohit Ghai, who has just opened the fine-dining Indian restaurant Kutir in Chelsea, will next turn his hand to a street food concept at Boxpark Wembley. Whereas once upon a time a chef with ‘fine dining’ aspirations would not have been seen dead in the mass market, it’s yet another example of the chef as ‘one-man-brand’ aiming to cover all aspects of the market at once. The chef, along with business partner Abhi Sandwan, is planning to launch KoolCha on December 8. It will feature an all day menu comprising dishes reminiscent of his childhood. The focus will be on north Indian ‘kulcha’ flatbreads served with pickles, dal, raitas, and chutneys. It sounds a little like Gopal’s. “KoolCha will be a new pan-Indian restaurant concept that promises to reinvigorate the Indian food space,” said Ghai. Ghai and Sangwan worked together at Harden’s newcomer of the year 2017, Jamavar, where Sangwan was director of operations and Ghai was executive head chef. They also both worked for JKS Restaurants, the ever-growing group behind the likes of Gymkhana and Trishna. Roger Wade, founder and chief executive of Boxpark, added: “We’re thrilled to announce that KoolCha will be launching at Boxpark Wembley. KoolCha’s chef Rohit has worked at an impressive number of world class restaurants and we have no doubt that KoolCha will be no different. KoolCha is the most recent addition to the Boxpark Wembley line-up. Already on the billing are Bombay Burrito, the Athenian, Nanny Bills, Smoky Boys, Spice Shack, Zia Lucia, Ugly Dumpling, and Thai Express. Looking for somewhere to spend New Year's Eve in London? M Restaurants' founder Martin Williams to rescue Jamie Oliver's Barbecoa? News Boxpark, chef Rohit Ghai, Mayfair, Wembley. permalink.